I’m probably going to get some haters for this one. 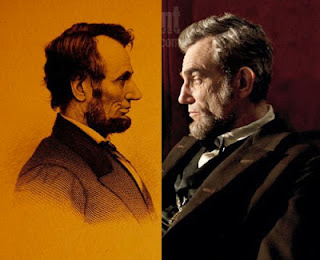 I wouldn’t necessarily describe myself as a history buff, but I was very much anticipating Steven Spielberg’s latest so-called “masterpiece,” Lincoln. Unfortunately, the lengthy, wordy scenes, unremarkable acting and overall drab tone left me underwhelmed and almost irritated. Daniel Day-Lewis’ physical resemblance to Abraham Lincoln is uncanny: he is unrecognizable as the actor from "There Will Be Blood" as he portrays this gentle giant. His embodiment of one of the most influential presidents in United States’ history is powerful, though often he was so soft-spoken that much of the dialogue fell flat. I was surprised to discover that the screenplay was written by Tony Kushner, who wrote “Angels in America,” which I very much adore. Unfortunately, Lincoln’s dialogue did not captivate me the same way. In fact, it didn’t captivate me in the slightest. The film chronicles the last 4 months of President Lincoln’s life, as he tries to pass the 13th Amendment to the Constitution which would abolish slavery, ultimately leading up to his assassination. The most exciting part of the film was watching the vote being cast in the House, even though we already knew how it would turn out. It takes a lot for me to space out during a film, and I couldn’t begin to count the times it happened during this one. I’d be very interested to discuss the movie with a history junkie, to see if their hopes for the film were met. The Academy loves Daniel Day, so I expect him to receive a nod. The make-up crew should as well, but Google Imaging a still from the film would have totally sufficed for me. (There, I did it for you.) In my humble opinion, unless you’re a history fanatic and have $10 and 2 ½ hours to spare, you’re not missing too much by passing on this one.